One of Chelsea's best-known private members club — and a landmark on the King's Road for more than 40 years — Raffles has entered its latest manifestation with a complete makeover from the ground up. The team of leisure consultants behind the new venture include Piers Adam, who has joined forces with Patrice Gouty, one of the co-founders of Chinawhite, Jeanette Calliva, party planner for Woodhead Calliva, and interior designer Tara Bernerd, of Target Living. It was Bernerd who masterminded the interior conversion, working in conjunction with main contractors, Du Boulay Contracts and The Sound Division Group. SDG had been recommended to the project by Piers Adam — a long-time friend of SDG's managing director David Graham — and they rose magnificently to the challenge with which they were faced. 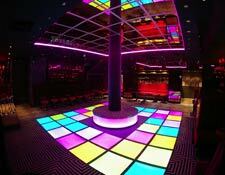 The club's operations director Alice Wilson explained that when the new consortium took over the 225-capacity 'Raffles Townhouse & Nightclub' from previous incumbents Chris and Alison Banks, securing a 5.30am operating license, they wanted the fit-out to be dominated by a combination of programmable architectural LED lighting and an illuminated matrix dancefloor in the best traditions of Saturday Night Fever. Under the stewardship of the experienced Jon Carey (JLC Contracts) and SDG installations manager Elliot Patterson, the installers deployed the same highly-qualified team of programming and project professionals that had delivered the highly complex Tamarai in Covent Garden at the end of last year. 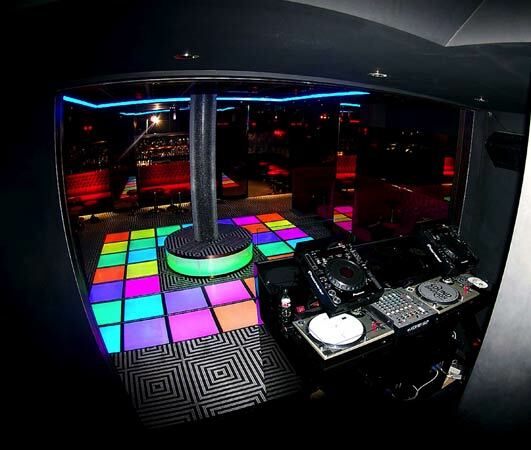 The company sourced all its LED lighting from Lighting Effects Distribution; they supplied the floor modules — comprising 40 x colour-changing AVR LED panels, with different combinations programmed into the ShowCAD controller, which drives the main dancefloor. Programmer Colin Walker ensured that ShowCAD was accompanied by an extremely intuitive touch screen interface, with colour combinations clearly (and affectionately) indentified with names such 'Alice's Favourite'! 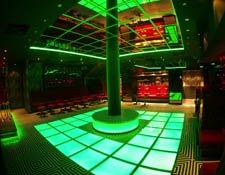 At the same time Sound Division placed nearly 17 metres of linear LGB LED strips around the mirror above the dancefloor, helping to create both a sense of vertical dimension and disorientation. The most popular item in the LED portfolio is the X-Chip, used effectively by David Graham’s company at venues like the K-Box, and here he calculates that over 800 of the RGB colour-change LED's — along with 16 driver boxes and power supplies — were deployed. 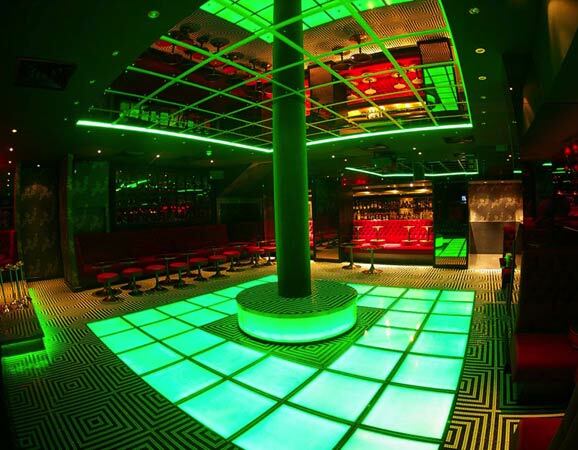 In addition, SDG extended their design to incorporate two fibre optic ceiling panels within the entrance foyer and walkway leading to the club to enhance the sense of anticipation. Elsewhere, some 62 x 1W white dimmable LED's were set within the frame around the DJ booth, with a further 40 of the same fixture set into the vanity frame outside the ladies' toilets, and 24 more installed on the three main staircases (including the one leading to the upstairs bar). Finally, further linear RGB strips have been placed at the dance podium and behind the lounge seating of both the main dancefloor and first floor chill-out lounge. While this creates constantly changing moods around the featured areas, a pair of AR12 controllers — respectively located behind the ground floor and first floor bars — manage the architectural lighting via preset programmes. For their sound design, the A/V specialists created a seven-zone layout, calling on the BSS Soundweb programming expertise of Martin Barbour (presently engaged on the huge 02 Arena project) to programme the gain structure and set up the routing pattern in a line-configured Soundweb SW3088LL digital signal processor; five strategically-placed remote wall panels provide local source select and volume control. SDG specified six wall-mounted NEXO PS8's and a pair of LS500 subs for playback in the main room. "We chose these because they were compact, high quality boxes," said David Graham. "They offered the best sound reinforcement solution for the space and budget available." NEXO's UK brand distributors, Fuzion plc, also supplied a pair of t&m Systems FG81's to the semi-secluded bar, facing the main dancefloor, and provided valuable on-site support in the form of technical director, Gary Ashton. Facing the dancefloor on the other side is the DJ booth, plugged with industry-standard Pioneer twin CDJ-1000 Mki3 CD players, Technics SL1210 Mk35 turntables, an Allen & Heath XONE:62 and a NEXO PS8 for monitoring. The remaining six zones — divided into Bar, Reception, Hall, Cloakroom, Toilets and upstairs Lounge, are serviced by a combination of JBL Control 25 wall-mount loudspeakers aof JBL Control 24C recessed ceiling speakers. Power throughout is provided by Crown Xs and XLS series amplifiers. "Sound Division have provided us with a highly-developed light and sound infrastructure," said Ms. Wilson. "At the same time, despite its complexity, they have provided us with a simple user interface and excellent on-site training. Their site team were extremely professional and were always responsive to our requests." After being closed for a year, Raffles reopened in mid-May, and Alice Wilson — who has worked in different capacities at the venue for three years — is delighted. She says that the powerful use of LED — coupled with the ceramic mosaic peripheral flooring, which runs throughout, and was supplied by local interior design showroom, Bisazza — has transformed the venue "into a stylish venue befitting its VIP clientele". And David Graham adds, "We realised the value of assembling a crack team while working on Tamarai nine months ago. The importance of this — and the lessons learnt during that Covent Garden project — have really paid dividends here."